Mikimoto vs. Retail: Who Offers the Best Pearl Quality? When you're shopping for pearls, you'll often see major names like Mikimoto thrown into the mix. While Mikimoto pearls are indeed excellent quality specimens, they come at a hefty price tag. Thus, many of our shoppers want to know: are Mikimoto pearls better than American Pearl pearls? The truth is that we handpick ours based on the same pearl ratings used by Mikimoto, therefore ensuring at least equal (but often greater) quality when compared to the big-name pearls. 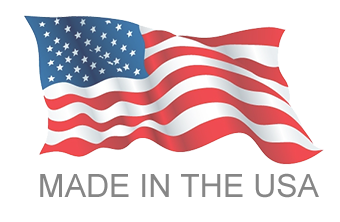 The best part about shopping at American Pearl is that ours come at truly wholesale prices. Mikimoto is one of the finest producers of Akoya pearls in the world and is widely recognized as the most prestigious pearl retailer in the industry. 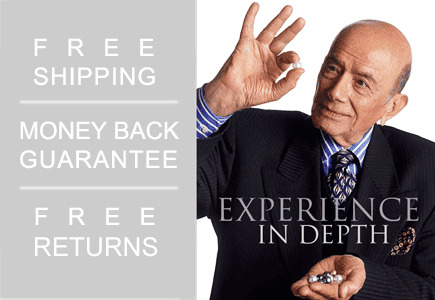 While Mikimoto's reputation for providing its clients with top-quality pearls is irrefutable, they also charge a considerable premium for their Mikimoto brand. American Pearl is one of the largest wholesalers of top-quality pearls in the United States. 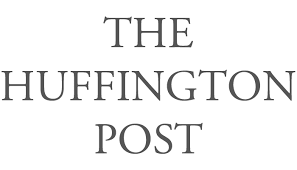 Our parent company has been in existence for over 50 years and is an approved supplier for some of the world's most prestigious jewelry firms, including Harry Winston and Tiffany & Co. Although we have a showroom in New York City, we do not have the overhead that retailers carry and we are able to generate a substantial profit selling our pearls without the retail markup that is typically three more times the wholesale price. While our prices may be substantially lower than those charged by Mikimoto and other high-end jewelers, our standard for quality is not. To help its clients understand its pricing scheme, Mikimoto's gemologists created the first widely recognized system for grading Akoya pearls using a system that uses the following grading nomenclature: A, A+, AA and AAA. 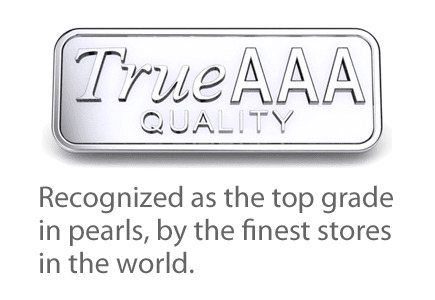 In the Mikimoto pearl quality ratings system all its "A" graded pearl strands fall within the top five 5 percent of the pearl harvest, with each sub-grade improving in quality and value. 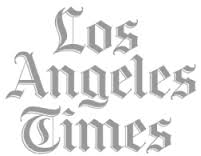 TRUE AAA is in the top 1 percent of all the pearls from the harvest. American Pearl is able to achieve the same consistently high grading standards as Mikimoto because the master strands used by our GIA-trained gemologists have been indexed to equivalently graded strands from Mikimoto using side by side comparison and lab testing. Our GIA-trained gemologists then use these Mikimoto indexed master strands to grade every strand of Akoya pearls that we sell. 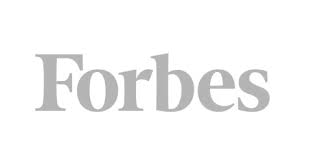 To provide our clients with further assurance of pearl quality ratings, all of our true AAA grade freshwater pearls and saltwater pearls are available with a report from the Gemological Institute of America - the most prestigious non-profit gemological institute in the world. In short, American Pearl guarantees that if you compare our strands side by side with equivalently graded strands from Mikimoto, the American Pearl strand will be of equal or greater quality. 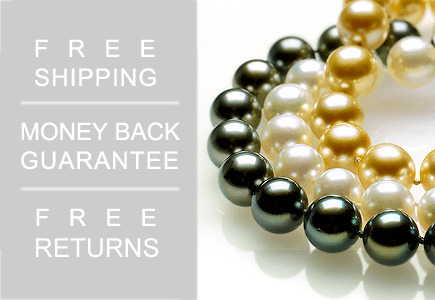 American Pearl backs this guarantee up with a no-questions-asked 90-day money-back guarantee on Akoya necklaces. American Pearl understands that it is difficult for our clients to compare the differences in quality between our pearls and those of our competitors, many of whom are selling so-called AAA strands for less (and in many cases more than American Pearl). It is important that our clients understand that there is no universally accepted standard for grading pearls. This deficiency gives pearl vendors license to create their own grading system and, unfortunately, they often create systems that are designed to promote the sale of their products, even if those products are of inferior quality. Please do not fall into this trap. The only way to appreciate the difference between the finest quality pearls and lower quality pearls is to comparison shop. Therefore, we strongly encourage our clients to visit Mikimoto, Tiffany & Co. and other fine jewelry stores before visiting our showroom or purchasing pearls from this site. This Mikimoto grading system deals more with the surface cleanliness of the pearls and their luster. Why? With over 100 years of pearl culturing and harvesting experience, Japanese Akoya cultured pearls exhibit the widest range of luster found in any pearls in the world. In fact, as one climbs up the rungs of the ladder from A to A+, from A+ to AA and from AA to AAA quality, the pearls exhibit more luster. In the A, A+, AA and AAA pearl quality grades, one is primarily concerned with the incremental increase of the luster of each of the pearls and surface cleanliness. This grading system was specifically designed by Mikimoto to grade pearls from the Japanese Akoya oyster because of the wide range of luster and surface quality produced by this oyster. In effect, this grading system does a good job in differentiating the nuances of luster and cleanliness. Akoya Pearls are routinely bleached in order to produce a white pearl. 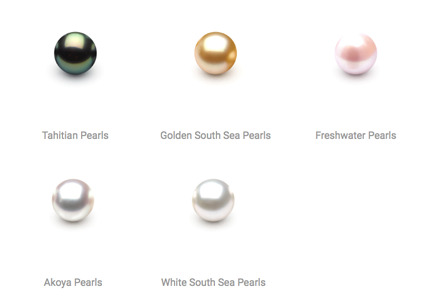 One should know that there are different kinds of pearls, from different oysters whose grading systems are different. With the birth of the South Sea pearl from Australia, Indonesia and Tahiti approximately half a century ago, pearl farmers and pearl dealers began using a different grading system to grade the surface cleanliness of white Australian South Sea Pearls and Tahitian pearls. Why? Because of the South Sea and Tahitian pearl's larger sizes and consistency in luster, pearl dealers are more interested in the surface cleanliness of the pearls. Most South Sea pearls have an extremely thick nacre (the skin of the pearl). This is why there is more consistency in the luster of South Sea pearls. Nacre and luster are often directly correlated. Thicker nacre pearls can deliver more luster. In contrast, the grading system for Japanese Akoya cultured pearls is concerned with describing the incremental luster of a pearl (combined with a pearl's cleanliness). The South Sea pearl grading system, the A, B, C and D nomenclature, is particularly concerned with describing the level of blemishing on the surface of the pearls. The use of the A, A+, AA and AAA grading system for South Sea pearls can also be used to describe the luster of South Sea and Tahitian pearls. When pearl dealers trade South Sea pearls and Tahitian pearls outside of the auction system, they primarily use the A, B, C and D nomenclature, which gives a more accurate description of the surface cleanliness of a pearl. An educated consumer who is shopping for truly fine-quality pearls should understand that there are particular grading systems suited for each oyster and the pearls it produces. So if you are shopping for South Sea pearls, find out what the quality of the surface of the pearls are using the A, B, C and D nomenclature. Have more questions or need more information? Our GIA-trained gemologists are available to answer any pearl related question you may have at any time between the hours of 10 a.m. and 5 p.m., either by calling 1-800-847-3275 (international callers dial 212-764-1845) or emailing sales@americanpearl.com.